Constructed in 1913 and originally owned by Dr. H.C. Finch. He named it “Hillcrest”. He and his family resided here until 1940 and were a vital part of the community and its growth. 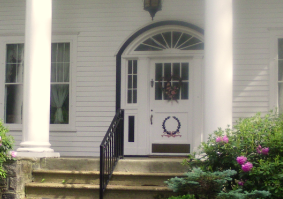 It is 0ne of Broadalbin’s fine historic homes, now owned and run by Christine Mayer, her family residence since 1990. The residence has changed hands many times over the years and has been many things, but is remembered most fondly by the locals as “The Candy Manor”. During the 1950’s and 1960’s it was owned by the Turner family who made and sold a variety of candy and sweets. It was remembered especially for its fabulous holiday displays and decorations. Hillcrest, now Finch House named in honor of the original owner, has always been a very special place, and Christine would love to share it with you. It is filled with character, ambiance and grace. You will enjoy the peaceful, homey atmosphere of this beautiful, stately home. Come for a visit and be a part of its history! From NYS Thruway take Exit 27 for Amsterdam. Follow Route 30 North (about 8 miles) to the Intersection of Route 29 at Vail Mills. Bear Right at the Traffic Circle onto Route 29. Go 1 mile. After traffic signal turn left onto E. Broad St. Take first right onto Spring St. go to end of street and turn right at E. Finch proceed up long driveway. You are there! From Saratoga Springs/ Exit 15 off I 87 Northway, Take Route 29 West about 23 miles to Broadalbin. Turn Right onto E. Broad St., Right onto Spring St. then Right on E. Finch. Fulton County is known for its 44 Lakes and its scenic beauty. It is the Gateway to the Adirondacks and offers a variety of outdoor sports and family activities, such as fishing, boating, hiking, biking, swimming and camping. Broadalbin is minutes away from Great Sacandaga Lake and its public beach and boat launch. Stop by the Chamber of Commerce Visitor Center for all the great things you can see and do in the area. It’s located on Route 30N and Route 29 in Vail Mills, just beyond the traffic circle.